The next issue of the Carnival of Mathematics, rounding up blog posts from the month of June, and compiled by Kartik, is now online at Comfortably Numbered. The next issue of the Carnival of Mathematics, rounding up blog posts from the month of April, and compiled by Becky, is now online at Lines, Curves, Spirals. 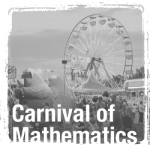 The next issue of the Carnival of Mathematics, rounding up blog posts from the month of February, and compiled by Ben, is now online at Math Off The Grid. The next issue of the Carnival of Mathematics, rounding up blog posts from the month of January, and compiled by Rachel, is now online at The Math Citadel. The next issue of the Carnival of Mathematics, rounding up blog posts from the month of October, and compiled by Frederick, is now online at White Group Mathematics. The next issue of the Carnival of Mathematics, rounding up blog posts from the month of July, and compiled by Kartik, is now online at Comfortably Numbered. The next issue of the Carnival of Mathematics, rounding up blog posts from the month of June, and compiled by Lucy, is now online at Cambridge Mathematics.